The States’ Glacier National Park is kind of a disappointment to someone familiar with Canada. The climbing is inferior to Canada’s Glacier National Park (i.e. Rogers Pass), and the peaks and glaciers are a lesser version of the Canadian Rockies. With the Going-to-the-Sun road mostly closed, access to peaks in Glacier is low and limited. From the west, the road is drivable only to the end of MacDonald Lake, at 3200 feet. 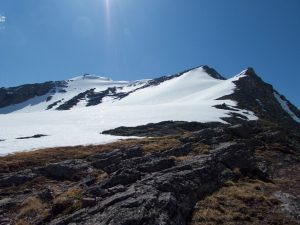 Trails seem to be mostly snow-free up to 6000 feet, and the snow is well-consolidated above that, but the few accessible peaks still tend to require about 6000 feet of gain. 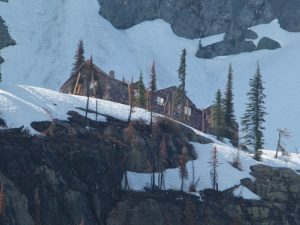 Gunsight, a 9000-footer above the recently-burned Sperry Chalet, is one of the easiest summits to reach in the area. It was well above freezing overnight, and the days are long, so there was no reason to get an early start — the snow would be what it would be. A fire last summer had burned a lot of the approach to the Sperry Chalet, as well as one of the Chalet buildings, but the Parks Service had been busy with a chainsaw, and the trail was clear up to where the snow started. It was a long grind up from the lake at 3200 feet to the start of solid snow around 6000 feet, about halfway to the peak elevation-wise. I was pleased to find the snow consolidated, even late in the morning in the woods. Above the chalet, the trail traverses a ledge to climb a sort of amphitheater, and this ledge was still holding a fair amount of high-angle snow. While I did not need my crampons, I was glad to have my ice axe with me, as a slip would have shot me off a small cliff. 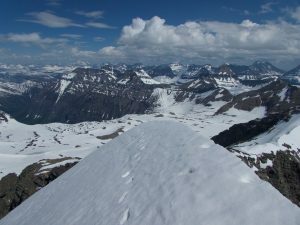 Above the traverse ledge, I climbed toward Comeau Pass in a more-or-less straight line, passing mostly-frozen Feather Woman and Akaiyan Lakes. While the peaks mostly seem to have standard white man names, many natural features have Native American names that I suspect were not given by the natives themselves. 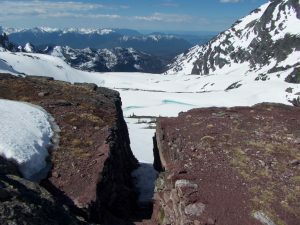 The final 20 feet to the pass is a slot in a headwall that was either blasted entirely, or improved with cut steps and some rock-work. From Comeau Pass, Mount Edwards is a 1000-foot climb to one side, while Gunsight is a 1200-foot climb to the other. I probably should have done both, but I had two more biggish days planned, and opted to only tag the higher peak. I stayed mostly on the rock of the northwest ridge, as the snow on the north face was not as well-consolidated as that lower down. The climb was straightforward except for the transitions between rock and snow. The summit was a narrow snow arete, hard on one side and calf-deep on the other. I tagged the high point, then sat on some rocks on the west side to have a snack and look down at huge Lake MacDonald 6000 feet below. The return went quickly, with a 600-foot glissade down the north face, then some plodding and boot-skiing down to below the chalet. I met a half-dozen people hiking the trail, including two girls with a map, who I encouraged to continue at least as far as the chalet. However, it seems like I have the high country to myself now — I saw some old ski tracks, but no boot tracks, despite the friendly snow. Their loss.